European Parliamentarian Soni Alfano is calling for a ban on Mafia 2, saying it trivializes the violence and murder carried out by the real-life Cosa Nostra. Alfano's father, Sicilian journalist Beppe Alfano, was murdered by the Mafia in 1993, an act that led her to become an advocate for people affected by Mafia violence and eventually the president of Familiari Vittime di Mafia, Italy's association for the families of Mafia victims. As part of her ongoing effort to speak out against organized crime, she's now using her position in the European Parliament to call for a sweeping ban on Take-Two's action-adventure game Mafia 2. "It really, really hurts," she said in an interview with Bloomberg. "We can't allow this to happen, our wounds are still too fresh." Mafia 2 wasn't the biggest hit of the year for publisher Take-Two but its relatively strong performance did contribute to a fiscal year profit of $42.5 million, quite a turnaround from its previous year loss of $140 million. But even as an M-rated title, the message it delivers to players is one that Alfano finds deeply objectionable. "These games transform the Mafia, a reality of death and destruction, into a thrilling and hands-on virtual pastime," she said. "Even if momentarily, players identify with brutal killers and for us who have experienced violence firsthand, it's appalling." 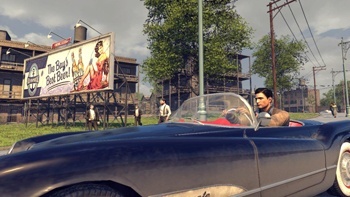 Alfano isn't alone in her criticism of the game; prior to the game's release, Italian American organization Unico National accused it of being "a pile of racist nonsense" that will "indoctrinate a new generation into directly associating Italians and Italian-Americans with violent, murderous organized crime."